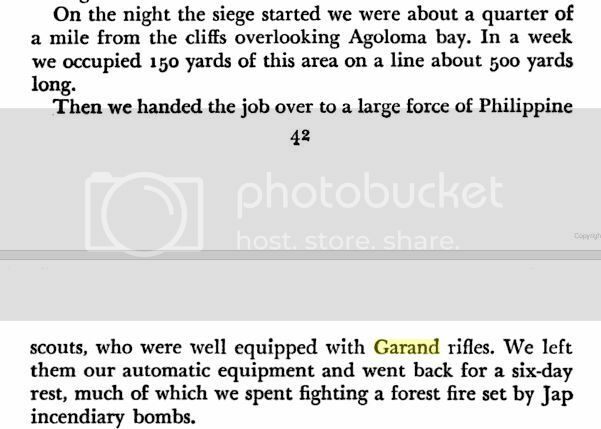 I've been meaning to start a thread that's a compilation of proofs that M1 Garands were used in Bataan. Although it seems that there are fewer skeptics now as compared to a few years ago, I still want to chronicle it in this thread. In a way, this is in response to the "experts" who pointed out to some of us portraying Philippine Scouts at living history reenactments that we had the wrong rifle for our impressions. And there are those who point out that to portray a PS accurately, you have to have a gas trap Garand. A screen shot from the Japanese propaganda film "Dawn of Freedom" (circa 1943?). They used American POW's as extras. In this scene, Americans are shown shooting M1's. The one farthest away looks like he does have a gas trap garand. 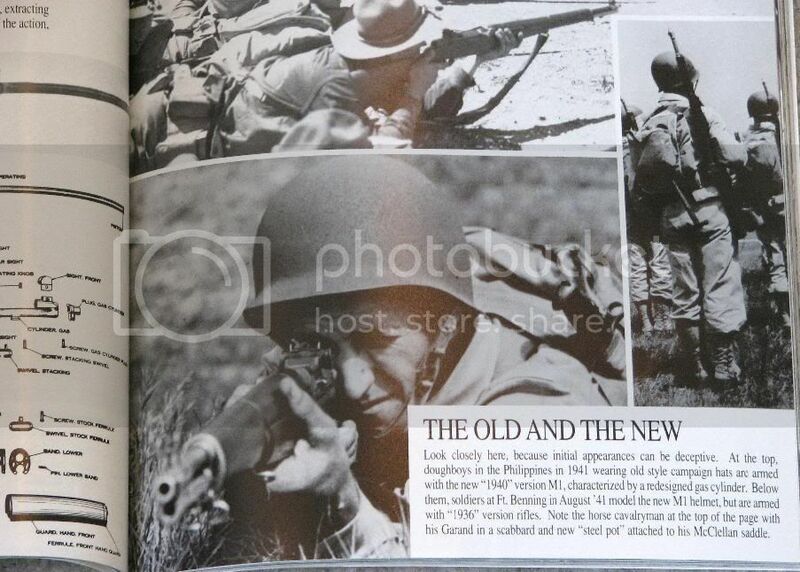 From the book "My M1 Does My Talking"
This is a Carl Mydans LIFE photo of a 31st Infantryman. I think he's one of two on guard or lookout duty at Fort Santiago. Note the gas port garand! 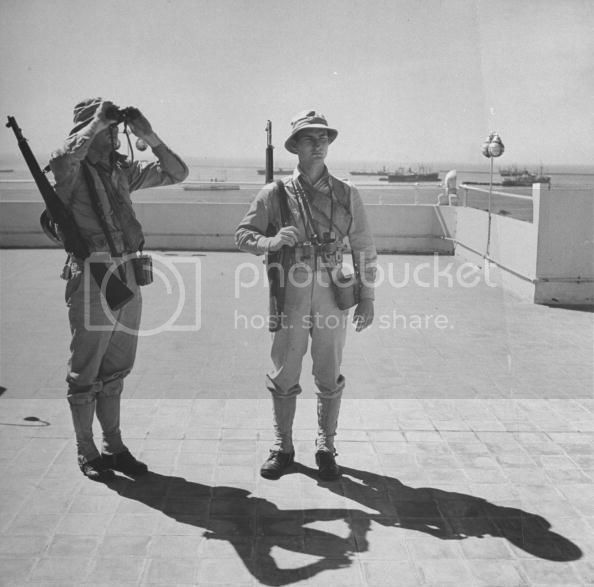 These two soldiers are (L-R) Ralph G. Payne and Albert F. Brown posing while on guard duty. They didn't survive the war. Both men were assigned to Regimental Headquarters and Headquarters Company, 31st Infantry Regiment and died in captivity at Cabanatuan. 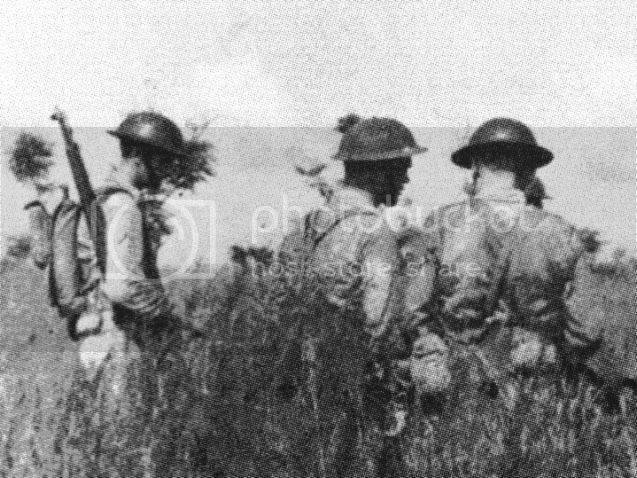 Philippine Scouts showing off battle captured Japanese items after the Battle of the Points. Note the Scout in the back holding an M1. 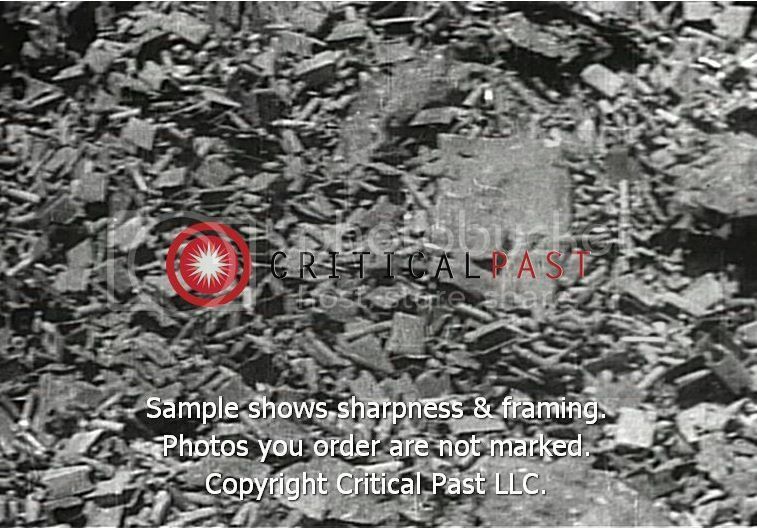 Video still from the website Critical Past, showing surrendered USAFFE equipment. An old magazine front cover that Philip Garcia found in a shop. It shows Filipina movie stars posing with some Philippine Scouts at Fort McKinley before the war. Note the M1's that the Scouts had at present-arms. The official newspaper caption for this photo is that this is supposed to have been taken in Bataan. But it looks like the central plains of Luzon with the Zambales mountain range in the far distance. 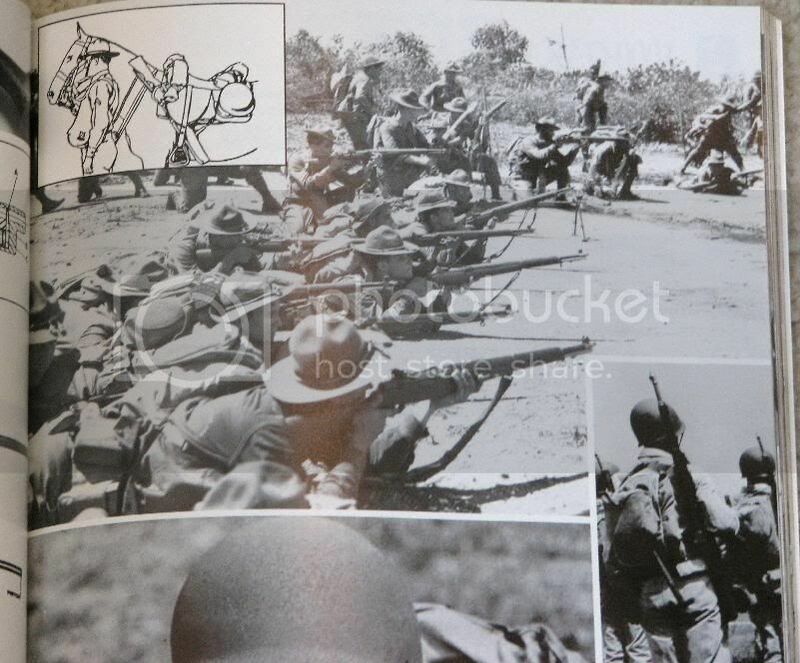 My guess is these are 26th Cavalrymen engaged in delaying action in central Luzon. They used molotov cocktails to try to stop tanks. There are more pictures but I need to remember where they are. I will also try to post excerpts from numerous books with references to M1's, many of them first hand accounts. Excerpt from "Bataan, Our Last Ditch" by John Whitman. "Both the Americans and Scouts carried the new semiautomatic M1 Garand rifle. Its eight-round clip and rapid fire - twenty to thirty aimed shots a minute - surprised the first Japanese to come up against it. The sights were designed to give good visibility at night, and it proved to be one of the most reliable and rugged rifles in military history. The M1's replacement of the beloved 1903 Springfield did not sit well with all soldiers, especially the older men who were proud of their careful trigger squeeze and marksmanship. The M1 seemed to encourage volume of fire over accuracy, and when war started, some men went to the extreme of swapping their M1's or buying an '03. 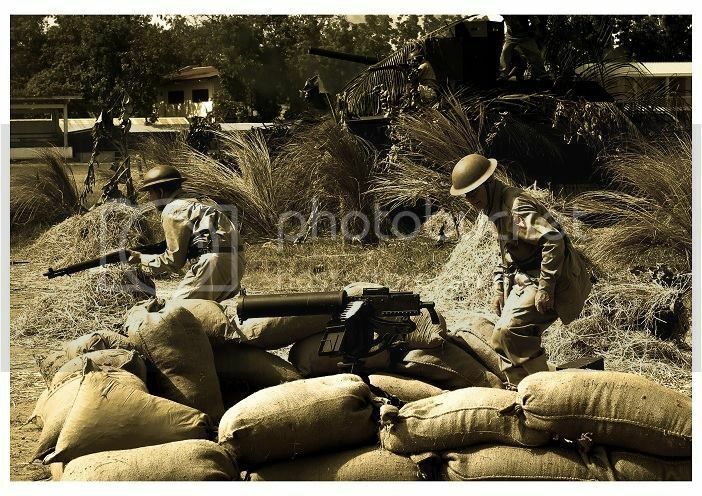 Although the situation with rifles was good, there was a shortage of light machine guns, 60mm mortars, ...."
"...Each rifleman carried 160 rounds of M1 ammunition, and the machine gunners carried 1,000. 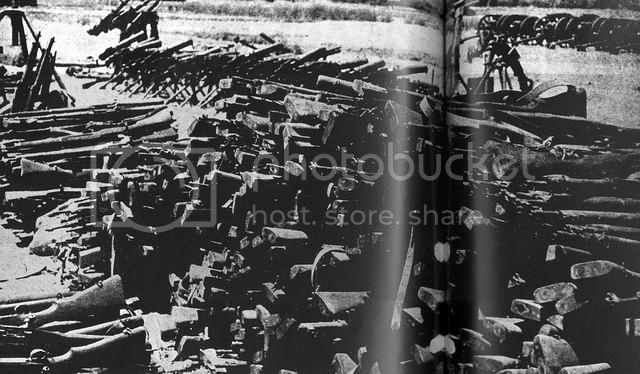 Although rifle ammunition was in adequate supple, there was a shortage of M1 clips, which reduced the Scouts to stripping the .30 caliber rounds from five-round Springfield clips and putting them into eight-round M1 clips. But morale was high. A third of the troopers had between eight and thirty years' service, and even the newest reqcruit had at least nine months. All were excellent marksmen. 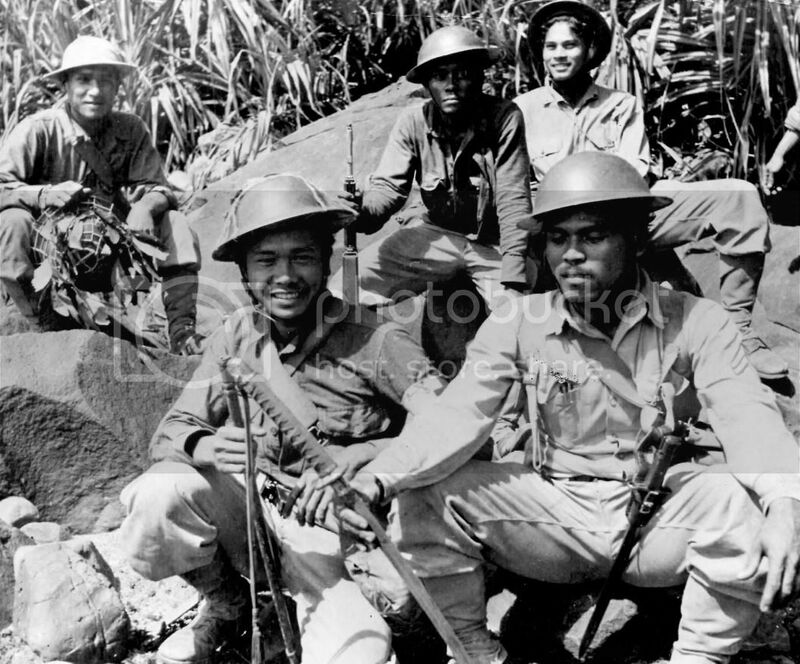 Dressed in khaki trousers, leggings, wool shirts, and steel helmets, the Scouts rolled their packs and shouted, 'Patay sila! ', 'They shall die!'" Although none of the veterans both Scouts and 31st Infantry that I've spoken to ever recalll having a shortage of enbloc clips. SR: How long were you in the defense line before you started getting attacked? 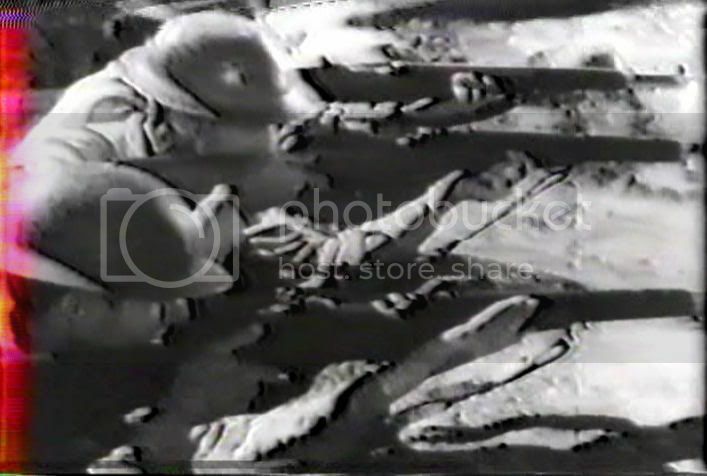 TC: Oh, man, we was there about ten days, and then we went to (Abu cay Hacienda? ), we had an engagement with them, and the only thing that saved us was the M-1 rifle. We had good firepower. EC: Can you describe your first combat experience? EC: Did you see them? Did you actually get to see the enemy? TC: No, I heard them when they made their Banzai charge. They scream like banshees, that will scare the hell out of you, but, you stiffen up because, "I got to do it." You know, nobody leaves the line, you got to do it, you stay there and fire away as you can, and the firepower is what prevented them to come in. You know, you take five guys with an M1 rifle, they got good fire. They could hold down a Japanese company of two-hundred-and-fifty to three-hundred men, because that's tremendous, you can't get through that wall of fire. An exchange between me and Tillman Rutledge back in 2009. Tillman was with F Company, 31st Infantry, and current commander of the Battlin' Bastards of Bataan organization. 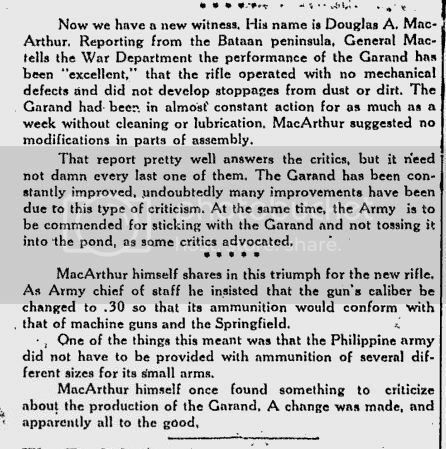 I just wanted to ask you about the M1 Garand during your time in Bataan. 1) When you went through boot camp at Fort McKinley, did you train on M1 Garands right off the bat or did they have you use Springfield 1903's . WE USED BOTH HAD TO QUALIFY WITH BOTH. 2) I heard that many 31st Infantrymen exchanged their Garands for bolt-action Springfields because the Garand jammed all the time. Is this true? THAT. SOURCE?? THE O3 WE USED TO SNIPER HUNT BUT FOR COMBAT WE ALL, THAT I SAW, USED THE M1. THE M1 DID NOT JAM ALL THE TIME. THERE WERE TIMES UP IN THE JUNGLES THAT THEY DID. OF COURSE IF ONE TOOK CARE OF HIS I QUESTION WEAPON THE JAMS WERE VERY INFREQUENTLY. I RECALL ONLY TWICE MY SLIDE JAMMED. I NEVER SAW ONE SOLDIER IN COMBAT USING AN 03. LIKE I SAID, WE DID FOR SNIPER HUNTING AS THE 03 IN OUR OPINION WAS MORE ACCURATE BUT THE M1 HAD FAR MORE FIRE POWER AND LIKE SITTING IN A ROCKING CHAIR TO FIR,.. IF THERE WERE SOME IN OTHER COMPANIES THAT THE CO ALLOWED THIS HE WAS WRONG. IN THE JUNGLES ON THE FRONT ACCURACY IS NOT THE GOAL, IT IS ALL THE FIREPOWER, EXCEPT LIKE I STATED, SNIPERS. A GARAND WAS NOT THAT DIFFICULT TO UNJAM AN M1. 3) Was there a shortage of enbloc clips that held the eight rounds for the Garand? NOT TO MY KNOWLEDGE. YOU COULD REFILL THE CLIPS EASILY. WE NEVER HAD A SHORTAGE OF CLIPS AND LIKE STATED, REFILLS ERE EASY. These seem like little insignificant details but they give me a sense of how it was. I hope you don't mind. NO PROBLEM AT ALL, VICTOR. ANY TIME. MH: How were you taken prisoner? Gordon: General Lough gave us the word of our unit's surrender. After hearing this, we camped in combat positions on Mount Bataan, known at the time as Signal Hill. A small group of us went farther up the mountain, in an effort to avoid surrender. Several days passed with no sign of the enemy. Hungry and in need of provisions, Corporal Elmer Parks (of Oklahoma) and I volunteered to drive down the hill to our last position in search of supplies. Elmer was driving and I was riding shotgun in a Dodge pickup truck. 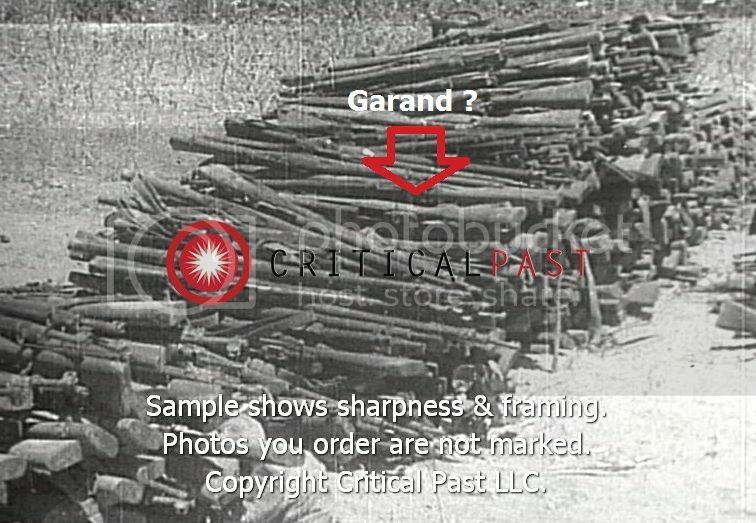 We gathered up a number of Garand M1 rifles at our former position, left behind by the Japanese, who did not want to use them. Loading the rifles aboard the truck, we decided to go a little farther down the road to where other units had been. Driving down the mountain road, we came upon a huge Philippine banyan tree, so large it served as a road divider. As we approached the tree, a lone Japanese soldier holding a rifle stepped out from behind it. Elmer stopped the truck, and we stared at one another, wondering what to do next. The thought of attempting to run occurred to both of us, as did the thought of picking up one of the newly acquired Garand M1s. But neither of us did a thing, other than stare at the Japanese soldier. Finally, he motioned to us to get out of the truck. At that moment 10 or 15 more Japanese came out from the brush lining the road. They surely had us in their sights all the time and probably would have enjoyed shooting us more than capturing us and adding to their burden. As the weather cooled, woolen shirts replaced the khaki worn during the hot season. Otherwise the uniform remained the same year around; khaki breeches, boots, and campaign hat, which was exchanged for a steel helmet in the field. The Scout wore an ammunition belt with suspenders, on which were attached his first aid packet, a pouch holding two pistol clips of .45 ammunition. 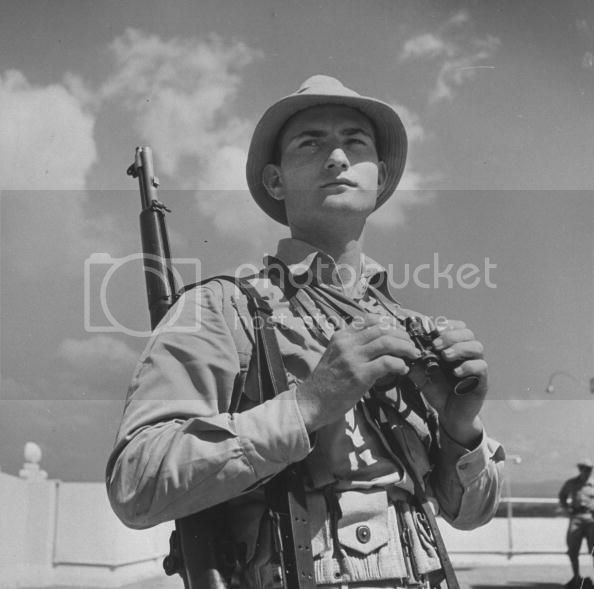 The rifle ammunition pouches on his belt were filled with eight-round clips for the M-1 rifle. Rifle ammunition was ball, except for one clip of armor-piercing and one of tracer. The gas mask hung on his left side. Hey Vic....In regard to the photo of the "G" Company Rifle Squad, I remarked a couple of years ago, when I first viewed this pic, that I thought that it must be the Company Rifle Team??? 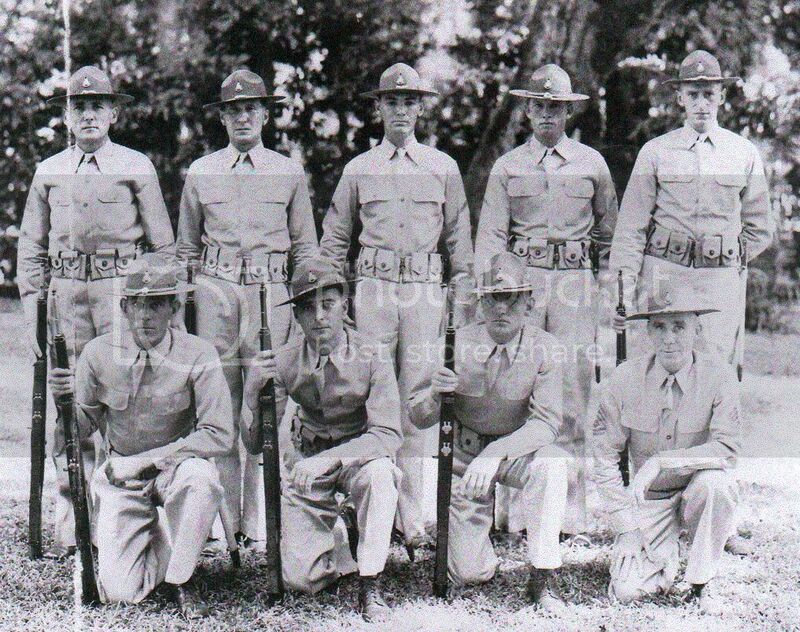 An ordinary Rifle Squad would have had a Corporal or maybe a Buck Sergeant, not an SFC or Tech Sergeant as is shown kneeling in the front row. Whatcha think? Whatever, this photo depicts the seasoned, career, older soldier, who made up the majority of the peacetime army between the World Wars. I think they were called "lifers", tough, durable guys who escaped the dreary life of plowing an Alabama tenant farm, the drudgery of some Pennsylvania steel mill or a Harden County, Kentucky coal mine. Little did they know when they disembarked in Manila what lay in store for many of them as the 1930s drew to an end. I have rambled on about this in the past. Cheers. 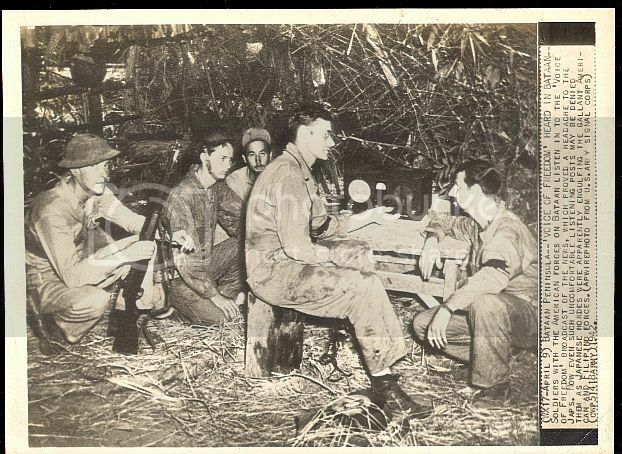 Hi Okla, in the book "Bataan, the Judgment Seat" which was a first hand account written by an Air Corps officer -- he referred to these senior NCO's as "Old-line" and it sounded like it was a generally accepted name for the old regulars or "Lifers" as you said. I think the "Lifer" term was coined around the Vietnam war. I started coming across that term when reading Vietnam books. Don't these G Company men look just like they stepped out of the movie, From Here to Eternity? Hey Vic....I have also heard those pre-war career soldiers called "old sweats". I may have mentioned to you that when I was in High School I had an older neighbor who had done a tour on Corregidor in the 1920s. He spoke of "serving the Big Guns" so he surely was in some 59th CA Battery rather than some QMC unit,etc. He told me that he jointed the Army and asked for foreign duty to escape the life of a tenant farmer. The 60th CA didn't arrive, as I understand it, until the 1941 "buildup" when War clouds were appearing over the Western Pacific. Cheers.. Postscript....Yes, those tough looking G Company guys look like something out of "From Here to Eternity". I believe I have also mentioned to you that my (now) ex-niece-in-law's Grandfather served in G Company of the 31st Infantry. I showed her this particular photo when it was posted on this site a couple of years ago. She said she was pretty sure that none of those men was her Grandpappy. Possibly the dark complexioned fellow kneeling next to the Sergeant, but probably not. 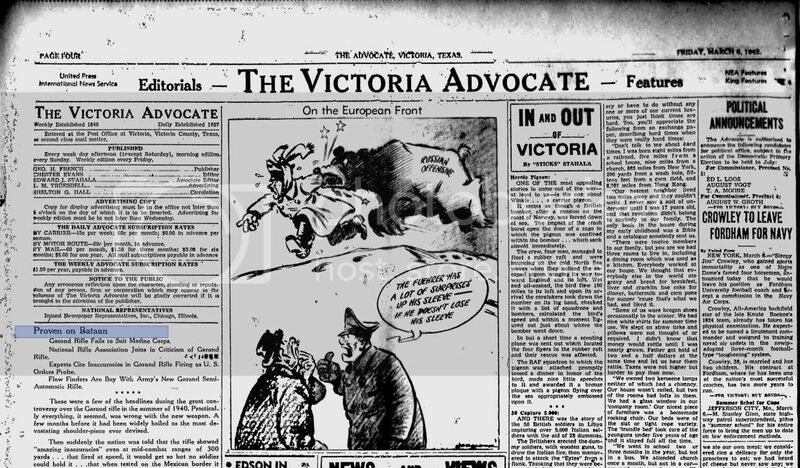 Hey Vic....I am sure you are more "up to snuff" on the 60th CA, etc than am I. I probably am confusing the 1941 reinforcements, which included the 200th CA (if memory serves was a New Mexico Natl Guard Anti-Aircraft Regiment) with the 60th. I don't believe the 200th ever served on Corregidor, being at Clark and maybe Manila. I do know that the 60th did receive substantial "beefing up" during the summer of 1941. The 59th, evidently, was near full strength when the war clouds began to gather. Cheers. You're right about the 200th CA. They arrived in 1941 and were an anti-aircraft unit from New Mexico. As far as the Coast Artillery units, including the Scouts, I think they were armed with 1903's, and not M1's. Here is an excerpt from the book, “Death March”, a collection of short first-hand accounts throughout the war timeline, compiled by Donald Knox. Now this is interesting because it’s the only account I encountered that said anything negative about the Garand. 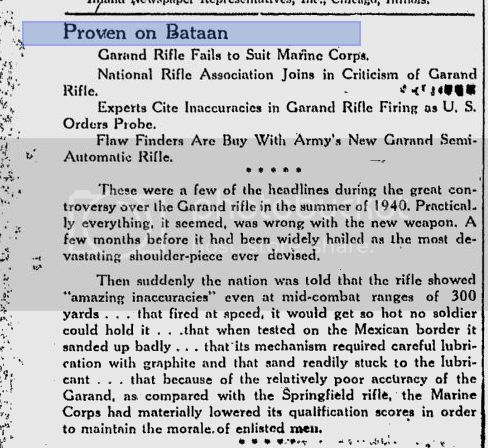 I have tried to corroborate the claim made by Pfc Snyder by asking other veterans who had used the the Garand in Bataan. Nobody agreed with the statement made by Snyder. Tillman Rutledge of F Company dispute this claim that most of the 31st Infantry exchanged their M1’s for Springfields. He said that they had a hard time acquiring a few Springfields for sniper hunting, how could “most of the 31st” have exchanged their M1’s for Springfields? He also thought it was absurd to exchange the M1’s for Springfields wholesale because they prized them for their fire power in the jungle. I therefore conclude that maybe in Snyder’s immediate squad, maybe they didn’t take care and clean their rifles so they jammed. But the claim that most of the 31st Infantry traded their Garands for Springfields was just a hyperbole, a figure of speech. 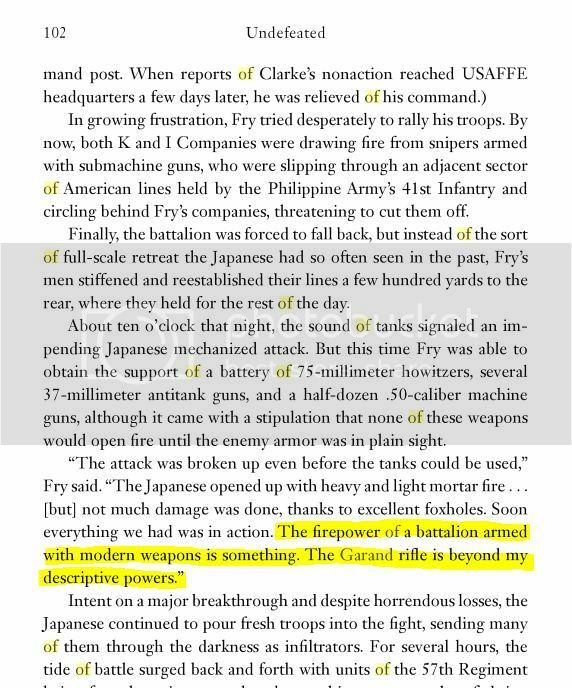 Unfortunately, I’ve met some people online who have read this book and this passage took it as gospel -- and clung on to the notion that the M1’s were a non-factor in the Battle for Bataan. Either way, it’s still a mention and proof in support of this thread’s topic that M1’s saw action in Bataan. “Death March”, Donald Knox, Page 30. 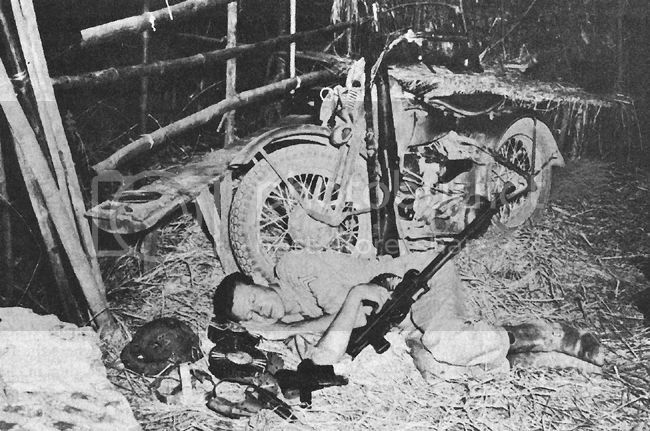 The rifles we had, the first M-1s, looked good but weren’t worth a hoot in the field. We got tired of pulling the trigger and having nothing happen. Most of the 31st Infantry traded them off to the Filipinos for their old Springfields. We knew when pulled the bolt back on an ’03 Springfield and shoved it forward, there’d be a bullet in there ready to fire. You’d take an M-1 out of its rack, hold it carefully in the truck that took you out to the range, get out, shoot, and it would be great. But take it out in combat where it got misused and dirty, and it became highly undependable. Another significant addition to the weapons inventory was the replacement of the 1903 Springfield rifle with the new Garand M-1 (semi) automatic rifle. This new firearm drastically augmented the number of rounds that a rifleman could pour on the enemy in a short period of time. To the consternation of the officers, the Scouts, particularly the older men who had grown up with the Springfield, were not thrilled with the new firearm. They were used to the carefully squeezing off each round. The lessons they had learned on the known distance range carried over into the field firing and produced satisfactory results. The new rifle spawned a tendency to spray the contents of a magazine with fewer hits. This undermined their confidence and required long and painstaking psychological training of even the platoon sergeants and squad leaders. Though they strove to follow the guidance of their officers, they were still skeptical when the war began. 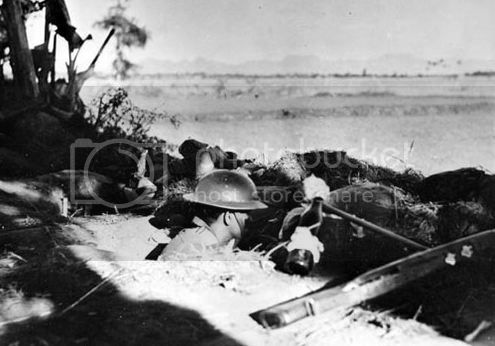 In fact, the company commanders were to find, once they got into combat, that some of the men went into the extreme of acquiring by trade or purchase an Enfield rifle with which the Philippine Army were equipped.